TENERIFE, Canary Islands — It rains little on this island. There are no natural rivers, and the air is full of the dry heat of the nearby Sahara. 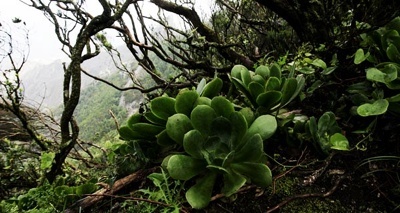 But in a ravine on the island’s northern tip, tree limbs drip with water and a tropical forest flourishes, sustained almost entirely by condensation from the low-lying clouds that are regularly pinned against the mountainside. The area, called Cruz del Carmen, is only one example of the unusual evolutionary habitats on the Canary Islands that fascinated Charles Darwin more than 100 years ago, and that today reveal a new species or subspecies to scientists an average of once every six days. But the unique plant and animal life here is being steadily overtaken by an invasion of foreign species, which have been entering these Spanish islands in increasing numbers since border checkpoints within the European Union were abolished under the Schengen Agreement a decade ago, according to government officials and scientists here. Usually you hear about the Canary Islands' human migration problems. Over the last 2-3 years, hundreds of sub-Saharan African migrants have crossed over from southern Morocco to the Islands, were they are usually caught and then released onto the Spanish mainland if their country of origin cannot be identified (they destroy all ID before they get there.) Not only is the trip dangerous and kills many migrants each year, but Spanish and European authorities are naturally concerned about how to stop the migration. What if the Middle East invaded North America?